Regatas Corrientes shot the lights out from three sinking 19 long-distance shots on high 52.8 percentage. International point guard Marcos Giordano (183-0) fired 22 points for the winners. 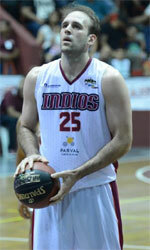 The former international forward Fabian Ramirez (193-90) chipped in 14 points and 6 rebounds. Four Regatas Corrientes players scored in double figures. Tomas Zanzottera (191-93) produced 22 points and 4 assists and American power forward Lee Roberts (201-87, college: Findlay, OH) added 17 points and 7 rebounds respectively for lost side. Both coaches used bench players which allowed the starters a little rest for the next games. Weber Bahia forced 23 Quilmes MP turnovers. Worth to mention a great performance of point guard Facundo Corvalan (188-98) who helped to win the game recording 16 points. Martin Fernandez (197-97) contributed with 13 points and 5 rebounds for the winners. Mateo Bolivar (187-92) answered with 12 points and 5 rebounds and naturalized Italian center Omar Canton (206-82) added 11 points in the effort for Quilmes MP. Both coaches tested many bench players and allowed the starting five to rest. Forward Patricio Tabarez (195-91) stepped up and scored 21 points, 6 rebounds and 5 assists for the winners and swingman Carlos Buemo (194-96) chipped in 10 points, 5 rebounds and 4 assists. Hispano Am. 's coach Marcelo Richotti used a ten-player rotation saving starting five for next games. At the losing side international guard Eric Flor (186-93) responded with 24 points and 4 assists and swingman Lucas Gargallo (196-95) scored 15 points, 6 rebounds and 4 assists. Both teams had four players each who scored in double figures. Olimpico de La Banda outrebounded Libertad Sunchales 39-25 including 28 on the defensive glass. The former international point guard Maximiliano Stanic (178-78) nailed 13 points, 6 rebounds and 7 assists for the winning side and Cuban swingman Karel Guzman (188-95) accounted for 16 points and 6 rebounds. American center Khalil Kelley (203-91, college: Pacific) came up with 14 points and 6 rebounds and Martin Cuello (193-93) added 11 points respectively for Libertad Sunchales in the defeat. Both teams had four players each who scored in double figures. The winner was already known earlier in the game, so both coaches allowed to play the bench players saving starting five for next games.